Writing about this little Argentinean wine remind me of a memorable trip in South America. In 2001, my best friends and I went trekking in the South of Chile in the massif of “Torres del Paine” for a few days. We flew to Santiago, stayed a few days to visit Chile’s Capital then took a flight to the south to arrive at the bottom of the world in the village of Punta Arenas. Just arrived we had to take a bus the next day early in the morning to go to Puerto Natales and catch our boat to the Massif. Despite its Captain and a "matelot" (or sailor if you prefer), the Pudeto Catamaran was empty of other tourists, so our boat-hosts offered us the local warming and comforting mixture as a reward for our genuine sympathy toward them. During this journey of a few hours before arriving to the massif, we end up drinking many shots of Pisco, mesmerized by the beauty of the surrounding mountains and enormous glaciers, and their reflections in the freezing water of the Lago Pehoe. Walking about 8-10 hours a day with heavy back packs, we trekked for 4-5 days in one of the most amazing trekking circuit of the world in this Park that was created in 1959 and was announced as a biosphere reserve by UNESCO in 1978. Over there, Nature still predominates and humans are like small and insignificant compared to the grandeur and the beauty of the landscape. I like Nature and try to respect it as much as I can and I guess growing up in a wine-producing region like Bordeaux, more precisely in the country side of Bourg-sur-Gironde (about 45 kilometers on the right-bank, north of Bordeaux) with a grandfather winemaker that grow everything in his own farm's garden, I have always been very close and respectful to the environment. However, Patagonia, the Andes and Torres del Paine reminded me how important and vital it is to pay attention and preserve our environment, and Nature in general with all the beings including plants, trees, animals, culture, traditions, art, etc. This trip was in 2001, but I feel that it is even more important, should I say crucial, nowadays. Back in Santiago and after a few days visiting wineries in Maipo and along the road of Valparaiso (which is by the way an amazing city built on slopes literally falling in the Pacific ocean and renowned for its fish dishes), we decided to take the bus to cross the Andes and pay a visit to Argentina, more especially Mendoza, on the other side of the Mountain chains. What a mess when we were stopped at custom for more than 3 hours at 2.00am. Middle of the night, at the top of the mountain somewhere at nearly equal distance between Santiago and Mendoza, freezing and lining up against a wall waiting in the cold for them to verify all the passport of all the tourists the bus contained. That too was memorable! We arrived by early morning on the other side of the Andes. Mendoza is like a little village with no high buildings. The center of the town is a huge pedestrian square (or rectangular I should say) area surrounded by small cantinas, bodegas and restaurants were you can eat some of the best steak(s) around cooked with the succulent and, in my opinion, totally underrated Argentinean mountain salt. There are about 210 kilometers between Lujan de Cuyo and San Rafael, and in between, like in most of the rest of the country in the south, you are in the middle of “La Pampa”, a real “no man’s land” of scorched earth, dust and stones and a few cactus…and not a soul for miles around on a very, very long straight road with the picks of the mountains in the far background on your right. Almost like if you were driving on a Monument Valley road between Arizona and Utah. However, if you make the journey, San Rafael and its wineries is quite worth the visit. Sorry I get carried away with my souvenirs, once again, so let’s back to our little wine of the day. Argentina, and specifically its Mendoza region has become Malbec country. Mendoza is a narrow strip lining the foothills of the Andes from Cafayate Valley north to Patagonia south. The near-desert conditions are remedied by water from the snow-capped Andes that also guard the area from radical temperature shifts that would otherwise hurt the harvest, and instead account for better fruit flavor and maturation in the clean, pollution-free mountain air. Resting on the San Andreas, Mendoza experiences near weekly small earthquakes that shift layers of sand, clay, and loam with gravel and limestone, providing Mendoza’s Malbec vines with superb root nutrients and variety. Early Spanish conquistas settled Argentina in the 16th century. They considered this new land’s hot, arid climate ideally suited to wine cultivation. It wasn’t until the late 18th century when the Governor of Cuyo in Mendoza, an area 625 miles west of Buenos Aires, requested Malbec, a classic French grape that was struggling in the cooler climate of Bordeaux, France, be brought to Argentina for wine cultivation. Argentina’s Spanish heritage and the Spaniards that, by virtue of their South American conquests, sparked what is today a spectacular heritage of Argentinean wine cultivation, with Malbec as the varietal king, inspired “Conquista”. 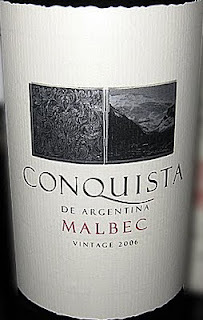 The 2008 Conquista is a blend of 88% Malbec mixed 6% Bonardo which offers soft, juicy fruit flavors; 3% Shiraz that adds richness and spice; and 3% Merlot for additional softness and fruit complexity. The grapes are hand harvested at optimum ripeness from the foothills of the Andes Mountains in the San Rafael region of Mendoza. Conquista is a gentle, fruity Malbec showing layers of blackberries and blueberries, hints of mocha and spice aromas. The palate is fairly rich, medium -full bodied with good balance and enhancing acidity. The earthy and integrated structure of the tannins in the finish adds texture and dimension to this tremendous value wine. Pair it with rich and hearty foods, roasted meats and vegetables, grilled foods, stew and mature cheeses.